Stonehenge as it probably was. Plan & Bird'seye View. The interest that has always attached itself to Stonehenge has, without doubt, been in a great measure due to the mystery as to the origin of this unique monument of bygone time. 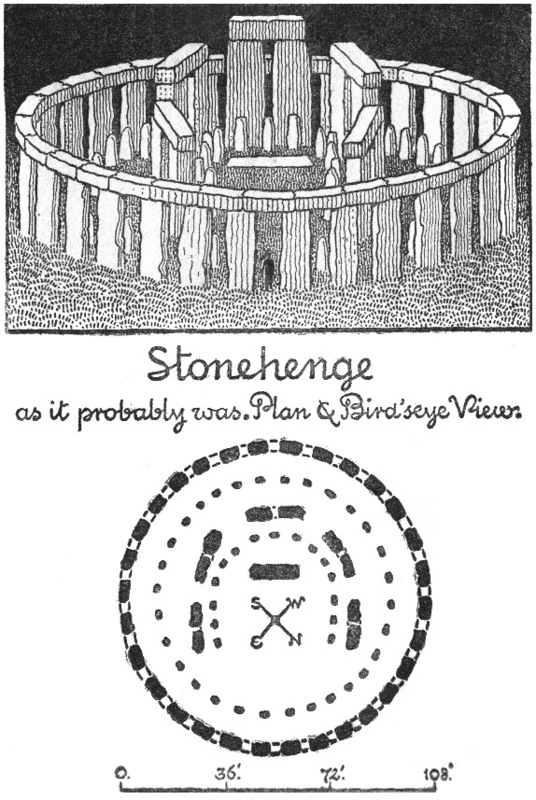 But the careful investigations carried out by the modern school of archæologists, as instanced in the work of General Pitt Rivers, Mr. Gowland, and others, every excavation being carried out with great care and scientific accuracy, have had good results; little by little the history of Stonehenge has been unravelled; a fact that Mr. Stevens has clearly demonstrated in the present volume. We now know how, when, and who, built this remarkable temple. One point, however, still remains a mystery, viz. whence the so-called foreign stones were obtained? Clearly, as geology shows, from no spot in Wiltshire. Amongst the many rude stone circles scattered over Great Britain, Stonehenge is unique, in the fact of having its sarsen stones carefully though roughly worked; and also in the introduction of [vi]the horseshoe within the circles, in the design or plan of the building. As in the present day, our churches, in their design, symbolise the Cross, so we may fairly infer that the horseshoe at Stonehenge had its own special meaning, as it still has in the East. I would advise all interested in the subject, after reading Mr. Stevens' lucid and comprehensive account, to visit this weird monument and judge for themselves; take Omar's sound advice, "To-day" view the "Dead Yesterday," wait not for the "Unborn To-morrow." Each statement is furnished with a reference to the particular pages in this book, where fuller information and arguments "for and against" may be found. (f) A ring of hewn Sarsen stones with "imposts" or lintels mortised to them. The lintels are fitted together with toggle joints. Sixteen out of the original thirty uprights of these "Trilithons" are now standing. (g) A ring of less perfectly hewn "Foreign Stones" (i.e. stones not to be found in Wiltshire at the present day). (h) Five great Trilithons, arranged in a horseshoe, with the opening to the north-east. These Trilithons rise gradually in height towards the south-west. The largest group of stones fell A.D. 1620. Those next to the great Trilithon on the north-west, fell on January 3rd, 1797. Stonehenge. Looking towards the South East. The large monoliths of Sarsen Stone were first of all roughly shaped as they lay in situ on the Plain and then transported to the chosen site. The Foreign Stones were also dressed on the spot before erection. The large Trilithons were erected from the centre of the site. It is a notable fact that the sun rises immediately over the summit of the "Hele Stone," in a line with the axis of Stonehenge on the Summer Solstice. Sir Norman Lockyer and Mr. Penrose, working on astronomical grounds, fix the date of the circle at 1680 B.C., with a possible error of 200 years on either side. 1. Stonehenge is probably the latest, and is certainly the most elaborate, stone circle in England. 2. It is the only one in which the stones are squared, dressed, and provided with lintels or imposts. 3. It is the only circle which contains a "horseshoe" arrangement of stones. 4. Most of the stone circles in the South of England face towards the north-east. Stonehenge is one of these. 5. Monuments of the Stonehenge type, but ruder, are found in the following neighbouring counties in South Britain: Cornwall, Devonshire, Dorset, Somerset, Wiltshire. 6. Though Wiltshire only contains four such monuments, two of them, Avebury and Stonehenge, are the most remarkable in the kingdom. Avebury, the older of the two, has been almost destroyed, but when perfect was one of the largest. Stonehenge, the later, is the most finished example of a megalithic circle in England. "We passed over the goodly plain, or rather sea of carpet, which I think for evenness, extent, verdure, and innumerable flocks, to be one of the most delightful prospects in nature. "—"Evelyn's Diary," 1654. The huntsman in the Vale of the White Horse, and the farmer on the fringe of the shady depths of the New Forest alike live in the presence of the Wiltshire Downs. There is something of grandeur in the immensity of their broad unbroken line stretching as they do, or did, for mile upon mile, limited only by the horizon, a rolling sea of green pasture. And the very heart of the Downs is the Plain of Salisbury, that broad stretch which is bounded on the west by the wandering valley of the river Nadder, and on the east by the trickle of the Bourne, between which the "Hampshire" Avon divides the area with almost mathematical accuracy in two equal triangles; and Salisbury lies at the apex of each. The pasturage of the Downs, and the rich woodland of these valleys must have been important factors in those old days, when the builders of Stonehenge pushed inland from the coast, seeking a spot wherein they might settle. As a general rule, it may be held with considerable certainty, not only in Wiltshire, but also in other parts of England, that our early settlers from the Continent elected to live on the downland rather than in the valleys. Go where you may over the Plain, its turfy surface is scored by terraces or "lynchets," telling the tale of the ancient ploughman's furrows on the slopes, and side by side with them lie the scars of what were once cattle enclosures, farms, and stockaded villages. Nor is the explanation far to seek, for the valleys afforded shelter to the wolves, and were in places obstructed by undrained marshes, unhealthy and unfitted for the herdsman and his flocks, and impenetrable as regards roads. Midway between the valleys of the Nadder and the Avon lies "Stonehenge," a Megalithic Monument without an equal in this country, about which the legend of the peasant, as well as the speculation of the savant have gathered in an ever-increasing volume. "Salisbury Cathedral and its neighbour Stonehenge are two eminent monuments of art and rudeness, and may show the first essay and the last perfection in architecture."—Dr. Johnson, letter to Mrs. Thrale, 1783. Stonehenge is one of those historical monuments which possesses the disadvantage of a reputation. The first impression is always one of disappointment, the circle appears so much smaller than it really is by reason of its isolated situation. Its proportions are dwarfed by the wide expanse of downland which surrounds it. This feeling of disappointment, however, gradually gives place to one of wonder, as the stones are approached more closely, and their bulk is seen in true proportion. The diameter of the outer circle of stones is 108 feet, or almost exactly that of the internal diameter of the Dome of St. Paul's. A casual glance even at the monument is sufficient to show that its basic form is intended to be a circle. The earthwork which girdles the stones is circular and 300 feet in diameter. Within this stands the remnant of a circle of 30 upright stones, bearing imposts upon them; within this again is what was once a circle of smaller stones. Inside these three outer circular forms are two others, shaped like a horseshoe. The first consisted of the five large "Trilithons," huge pylons of stone, comprising two uprights and an impost; standing separate, while in front of them is the remnant of a horseshoe of small upright stones, similar to those which comprise the inner circle of the monument. Upright stones shaded—Prostrate stones in outline. At first it may seem difficult to disentangle the chaos of fallen stone which meets the eye; but when once the original design of the structure is grasped, it becomes easy to piece together again in imagination a work which even in the light of modern and scientific engineering presents very considerable difficulties and problems. Lying flat within these concentric circles and horseshoes is a single flat tabular block generally known as the "Altar Stone." From this slab, now almost buried beneath the remains of a fallen Trilithon, the visitor may look in a north-easterly direction, and through the arches of the outer circle observe the "Hele Stone" or "Friar's Heel," which stands at some considerable distance from the main structure. On the Summer Solstice (or "Longest Day"), the sun rises immediately over the top of this monolith, when viewed from the centre of the Altar Stone. Such, then, are the facts which meet the eye when standing within Stonehenge. Each minute the stones appear to increase in bulk, and the problem of their coming grows more inscrutable. Then if wearied with such vastness, the eye may wander over the surrounding plain, broken in almost every direction by the sepulchral mounds, or Barrows, which cluster to the number of two hundred or more about the venerable stone circle. The connection between Stonehenge and the Barrows, seems almost irresistible. The hands which raised those huge monoliths must assuredly have been laid to rest almost within the touch of their shadow. Stonehenge and the Barrows, each casting light upon the other's origin, confirming and reconfirming each other's existence, knit together to-day as yesterday, by a bond of close union which even Time and speculations cannot sever. Weatherworn and overgrown by lichen, it is not possible at the present day to see clearly the nature of the stones which go to make up Stonehenge. For that reason only the barest outline of the monument as it appears to the unknowing eye has been given, in order that the original plan may be grasped thoroughly before entering into those important issues which help to solve the enigma of its origin. Careful investigation reveals the fact that the stones vary very much in material, and that, further, just as the stones are placed in systematic order, so, too, has the same care been exercised in the selection of the material from which each circle or horseshoe has been built. Moreover, just as the stones can be divided into groups of uprights and imposts, or "Trilithons," and "simple uprights," so, too, has it been found that while all the Trilithons are composed of a "local" stone, known generally as "Sarsen"; all the "simple uprights" are of "foreign" stone, sometimes classed together roughly as "Syenite." This latter term must be understood in a very comprehensive sense since the simple uprights show considerable variation in quality, but one and all are foreign to the county of Wiltshire; whereas the larger Sarsen blocks are to be found in considerable numbers scattered over the Wiltshire Downs. This difference in material seems to present a considerable difficulty; and the question naturally arises, How did the foreign stones come to Salisbury Plain? This point will be considered later, as it is one involving other matters, such as the ethnology of the builders and the probable region from which they obtained these unusual materials. But the Sarsens present no problem, and so may be considered first of all, for familiar as they are their story is full of interest. The geologist would probably describe the Sarsen stones of Wiltshire as "masses of saccharoid sandstone," which in plain English might be rendered as boulders closely resembling gigantic lumps of coarse sugar. These huge stones are to be found, though in decreasing numbers, scattered all over the plain, and particularly along the ridges of the Marlborough Downs. The country folk, always picturesquely minded, call them "Grey Wethers," and indeed in North Wilts, it is not hard to conjure up their poetic resemblance to a flock of titanic sheep, reclining at ease upon the pasturage of the Downs. The alternative name Sarsen, has an interesting derivation. It is a corruption of the word "Saracen." But what have Saracens to do with Wiltshire? Frankly nothing. The name has come to the stones from Stonehenge itself, and is a part of that ever interesting confusion of ideas, which has been bequeathed to us by our ancestors of the Middle Ages. To them all stone circles and megalithic monuments were the work of heathens, if not of the devil himself. Heathenism and all its works was roundly condemned, whether it be Celtic, Mahomedan, or Pagan; and the condemnation was as concise and universal as the phrase "Jews, Turks, Infidels, and Heretics" of the Christian Prayer Book to-day. In the early days of the Moyen Age, the Saracen stood for all that was antagonistic to Christianity. Consequently the stones of Stonehenge were Saracen or heathen stones, which the Wiltshire tongue has shortened in due time to Sarsen. This confusion of ideas may seem amusing, but it is not more absurd than the existing popular idea that Stonehenge is of Druidical origin. The stone circle of Salisbury Plain was many hundred years old when those half mythical Celtic priests first set foot in England, and the Druids of yesterday have about as much connection with Stonehenge as the Salvation Army of to-day. The Sarsen well repays a close examination. A glance at one of these stones as it lies on the Downland, shows that it has suffered greatly from the weather. It is the core, or kernel, of a much larger block of friable sandstone, worn away on all sides by wind and weather. Moreover, these isolated blocks appear on the Downs in a country devoid of any rock save chalk. How came they in their present position? In one sense they never came at all; for they existed on the surface of the chalk from the time it rose from the bottom of the sea to its present position. They are, in fact, the remains of a great sheet of fine sand and gravel cemented together by silex, which formerly overlay the chalk downs, the other parts of which have been dissolved and worn by wind and rain until only the harder cores or kernels survive to tell the tale. And the proof of this is not far to seek. The chalk of the London Basin is still capped by layers of such sandstone, as may be seen at Purfleet in Essex. The titanic sheep, or Grey Wethers, therefore, are merely a small residue of that widespread sandy deposit which once covered the whole of the south of England with its inhospitable sheet, and of which larger patches remain to-day in Surrey, Hampshire, and the Isle of Wight. But though the hand of Time and the buffets of the weather have been heavy on the Sarsens, the hand of man has likewise borne its share. In a district like the Plain, devoid of building material other than flint, these stones have attracted the unwelcome attention of the farmers. Walls, gateposts, and paving-stones have accounted for many, while in the interest of the road-mender many a noble Grey Wether has been led to slaughter to provide macadam for the roads. Hence it is not surprising that the number of Sarsen stones to be found on the Plain where Nature placed them is becoming less and less. Indeed, the time may yet come when they will be as extinct as the Great Bustard who once strutted among them, and their memory will survive only in their accidental use in a prehistoric monument like Stonehenge. While the Sarsens usually awake the greatest interest by reason of their bulk, and the problem of how a primitive people was able to deal with them, a far greater problem is presented by the small uprights, or Foreign Stones, the like of which cannot be matched within a hundred miles of Salisbury Plain, while some can only be found upon the continent of Europe. Fragments carefully removed and submitted to mineralogists have made this fact abundantly clear, and consequently it is possible to arrive at the very definite conclusion that Stonehenge is certainly not a "Wiltshire" monument, and probably that it is not even "British" at all. Where have the stones come from? One school of writers ventures to suggest Kildare in Ireland. Others suggest Wales, Cornwall, Dartmoor, Shropshire, or Cumberland, where similar rocks are to be found, though perhaps not absolutely identical in character. Yet another theory advanced is that the Foreign Stones were transported to the plain as boulders of the "glacial drift." It has even been stated that the gravels of the district contain small pebbles composed of rock similar to these mysterious Foreign Stones. The statement has indeed been made, but as yet no Wiltshire geologist has produced one of these pebbles of which so much is written, and so little seen. These Glacial Drift theorists, further account for the absence of these foreign stones elsewhere than at Stonehenge, by yet another theory, that they, like most of the Sarsens, have all been used up for millstones, gateposts, and road metal. There are many millstones and gateposts in Wiltshire, but where is there one which corresponds in any way to the upright Foreign Stones at Stonehenge? The production of pebbles from the gravels of Wilts, or of a specimen gatepost or millstone would at once settle this question. Unhappily this tangible evidence is wanting, so, alluring as the Glacial Drift theory may appear, it must reluctantly be set aside for want of convincing evidence. Finally, there seems every reason to believe that the small upright stones are "naturalised aliens" from abroad, and that is why they have been described at the commencement of this section as "Foreign Stones." It must not be taken for granted that the small upright stones at present standing represent all the foreign rocks employed. Probably they are merely the hardest and most durable of those used in the original structure, the softer and more friable examples having disappeared entirely, owing to the action of the weather, and possibly also to the assaults of the unchecked relic-monger, who until recent years could with his hammer collect souvenirs with impunity. In this connection, there is a story afoot that a hammer was kept upon the mantelpiece of a well-known hotel in Salisbury, which was reserved for the use of those intending to see Stonehenge, who might be wishful to bring back some convincing evidence of their visit. In all probability these foreign stones originally numbered forty-five. To-day there are but thirty. A complete lithology of the stones made by the late Professor J.W. Judd, in 1901, reveals the following rocks as comprising those used in the construction of Stonehenge. 1. Sarsens.—Coarse and fine-grained Sandstone similar to the Woolwich, Reading, or Bagshot beds. This stone is used for the Trilithons, Hele Stone, a recumbent stone known as the "Slaughtering Stone," and two small stones set north-west and south-east of the circle. It is of local origin. 3. Highly altered basic Tuffs, and agglomerates (calcareous chloritic schists).—Only one stump now remains. 4. Altered Rhyolites and Dacites.—Only fragments of this rock have been revealed during Mr. Gowland's excavations in 1901. At one time doubtless there was a whole upright of this material, but its striking appearance and fracture has probably led to its demolition by generations of souvenir hunters. Other fragments have been found in the barrows once within sight of Stonehenge, but now destroyed by cultivation. 5. Sandstones, Grits, and Quartzites.—The "Altar-Stone" belongs to this class. It is interesting to note that Professor Maskelyne has pointed out the similarity between the Altar Stone at Stonehenge, and the "Stone of Destiny" in the Coronation Chair at Westminster Abbey. 6. Grey Wackés.—Fragments only of these stones have been discovered among the chippings incidental to the dressing of the stones before erection. Their absence at the present day is not a matter for surprise, as stones of this class weather badly, and when exposed to the action of frost and cold rapidly disintegrate. 7. Argillaceous Flagstones and Slates.—As in the case of the Grey Wackés, fragments only of these stones exist to tell the story of the uprights which have vanished under atmospheric changes. 8. Glanconitic Sandstone (possibly Upper Greensand? ).—Traces of this rock have been discovered at Stonehenge by Mr. Cunnington. Professor Judd suggests the possibility of a boulder of this material having been found and used by the builders of Stonehenge. 9. Flints.—These of course are naturally found in abundance throughout the district. Most of those found within Stonehenge are broken fragments struck off in the process of repointing flint chisels during the erection of the circle. The above catalogue of stones may not convey very much to the ordinary visitor, and has only been inserted for the sake of completeness; or for the information of geologists who may be concerned with this aspect of the history of the monument. The conclusions to be drawn from such a list, however, are not without interest to the general reader. From the varied fragments found, it is apparent that some six, or perhaps seven, different classes of stone were used for the small uprights, but that only the harder and more durable rocks (the diabase, rhyolite, etc.) have survived. The softer rocks (basic tuffs, grey wackés, flagstones, and slates), being more easily broken, have fallen victims to the souvenir hunter, and to the action of the weather, rain, and frost. Originally, as has already been stated, the foreign stones numbered forty-five, disposed as follows: thirty in the outer circle, and fifteen in the inner horseshoe. To-day only nineteen exist in the outer circle, and eleven in the inner horseshoe. A very striking proof that many of these foreign stones have disappeared, is to be found in the wide gaps which exist to-day in certain parts of the circle. That such gaps were originally filled by standing stones is beyond question, indeed, the base of a "schistose" stone (see Class 3 in the Lithology above) was actually discovered by Mr. Cunnington in the course of his investigations into the nature of the rocks composing Stonehenge. It is highly probable that careful and scientific excavation may add greatly to our knowledge in this direction. There is yet one other point of interest in connection with these foreign stones. On entering the circle from the north-east (the usual path taken by visitors) a recumbent foreign stone will be noticed on the left-hand side, which has two cavities worked in it. This is the only worked foreign stone in the whole monument, and at first sight these cavities may possibly suggest themselves as "mortise holes" similar to those on the Sarsen trilithons, to be described later. It has even been suggested that the small uprights once carried imposts, or lintel stones similar to the trilithons, on the evidence of this one stone. Such a theory, however attractive, should be accepted with due caution, for the cavities on the stone are far from the ends, and situated too close together to justify a comparison with the existing Sarsen trilithons of the outer circle. This stone has never yet been explained and its position defined, consequently it is omitted from the frontispiece. Outside the circle of Trilithons stand three stones which have not as yet been described in detail, since they do not fall within the geometrical arrangement of the circle. They are, however, of the highest importance, as it is from them, and from their position, that it is possible to gather some conclusions as to one use to which the structure may have been put. Within the circular earthwork, lying in a line north-west and south-east, are two small untrimmed Sarsens, while outside the earthwork stands yet another unworked Sarsen, already referred to as the "Hele Stone" or "Friar's Heel." The fact that these three Sarsens are unworked, while all the others show very marked traces of dressing and trimming, is one that should be remembered. These three stones occupy no haphazard position either. As already stated, the "Hele Stone" marks the rising of the sun on the Summer Solstice. The remaining two mark both its rising on the Winter Solstice, and its setting on the Summer Solstice. This stone, as being the largest of this group of three, and such a conspicuous feature in the structure, demands something more than mere passing mention. It is a monolith of unwrought stone standing sixteen feet high. Such untrimmed stones are to be found all the world over in connection with religious rites. Even the Jews were not untainted with this early cult of stone worship. "Among the smooth stones of the valley is thy portion; they are thy lot; even to them hast thou poured a drink offering, hast thou offered a meat offering," writes Isaiah. In Christian times the custom continued. The Council of Tours as late as A.D. 657 categorically excluded from Christianity all worshippers of upright stones; while later, Canute forbade the barbarous worship of stones, trees, fountains, and heavenly bodies. At once, therefore, this huge unwrought monolith suggests religion, and probably one of the earliest, and most primitive forms of worship. And thus being obviously connected with non-Christian rites, it is not surprising to find that it has a "devil-legend" attaching to it. The devil, so the story runs, determined one day to undertake some great and stupendous work, for the like of which he is famous throughout the world. In this devil we can still discern the Scandinavian "giant" legend, which in later Christian times became "devil" legends. The work had to be great, puzzling, and amazing to all beholders, for as the Wiltshire story-teller adds, "he had let an exciseman slip through his fingers." In the course of his wanderings up and down the earth, he had noticed some huge stones in the garden of an old crone in Ireland; and he determined, therefore, to transport them to the stoneless waste of Salisbury Plain as being the most unlikely spot in which to find such things. There yet remained the old woman's permission to be obtained before he could commence his labour. His request was at first met with a flat negative, but eventually the devil so played upon her cupidity, by the assurance that she could have as much money as she could count and add up while he was engaged in the work of removal, that she readily gave her consent. As usual the devil had the best of the bargain, for he, knowing her powers of arithmetic to be but scanty, handed her a number of pieces of money, whose value was fourpence halfpenny, and twopence three-farthings. The dame had barely managed to add the first two coins together, when the devil called upon her to stop, and looking round she saw the stones were all removed, and had been tied with a withe band into a neat bundle which was slung upon his shoulder. Away flew the devil towards Salisbury Plain, but as he sped onwards the withe cut deep into his shoulder, so heavy were the stones. He endured it as long as he could, but just towards the end of his journey, while passing over the valley of the Avon, he winced, and re-adjusted his burden; in so doing one of the stones fell down and plunged into the river at Bulford, where it remains at the present day, as witness to the veracity of this legend. Right glad to be rid of his burden when he reached the Plain, the devil made haste to set up the stones, and so delighted was he with the result of his first efforts, and with the progress he was making, that he cried aloud with glee, "Now I'll puzzle all men, for no one knows, nor ever will know, how these stones have come here." Unluckily this bold boast was overheard by a holy friar walking near, who straightway replied in right Wiltshire fashion, "That's more than thee can tell"; and then realising who the builder was, turned and fled for his life. Enraged at his discovery by the friar, and perceiving that his scheme had failed, the devil, who had just taken up a stone to poise it upon its two uprights, hurled it at the holy man, and struck him on the uplifted heel as he made haste to run. The friar's sanctity was evidently greater than his personal courage, for it was the stone and not the friar which suffered most from the impact. Even to-day the huge impress of the Friar's heel is to be seen upon the stone. At this juncture the sun rose, and the devil had perforce to relinquish his task. This accounts for the present scattered appearance of the stones. Turning from fancy to fact, the word Hele, from which the stone takes its name, is probably derived from the Anglo-Saxon verb helan = "to conceal," and is so applied to the stone because it conceals the sun at rising on the day of the Summer Solstice. In all matters of archæology it is constantly found that certain questions are better left in abeyance, or bequeathed to a coming generation for solution. The "Slaughtering Stone" appears to be an admirable example of this class. Just within the area enclosed by the earthwork circle, lies a prostrate Sarsen Stone, to which this name has been given. The idea of its having been used as a place of slaughter for the victim intended for sacrifice in the "Temple" of Stonehenge, seems to rest upon a very bare foundation. It is probably a picturesque piece of nomenclature devised by certain bygone antiquaries to whom Stonehenge was a "Druidical" monument, and who, therefore, having the idea of human sacrifice, and "wicker figures" prominently before them, naturally jumped at the idea of providing a slaughtering stone for the numberless human victims whom they imagined had been slain there. Nevertheless, the stone is curious because of the row of holes which have been worked across one corner, which certainly is unshapely, and which would square up the stone very nicely if it were removed along the line of these holes. The indentations are somewhat oval, suggesting that they were made by "pecking" with a sharp instrument, rather than drilled by a rotating one, which would make a circular incision. Having recorded this, however, there is little to add, except that Mr. Gowland, who minutely examined the stone in 1901, is of opinion that the oval indentations referred to are more recent than the building of Stonehenge. Had they been contemporaneous with the erection of the Trilithons, he is convinced that the action of the water in the holes, combined with frost, would have caused a very much greater amount of disintegration than exists to-day. Yet another difficulty arises. 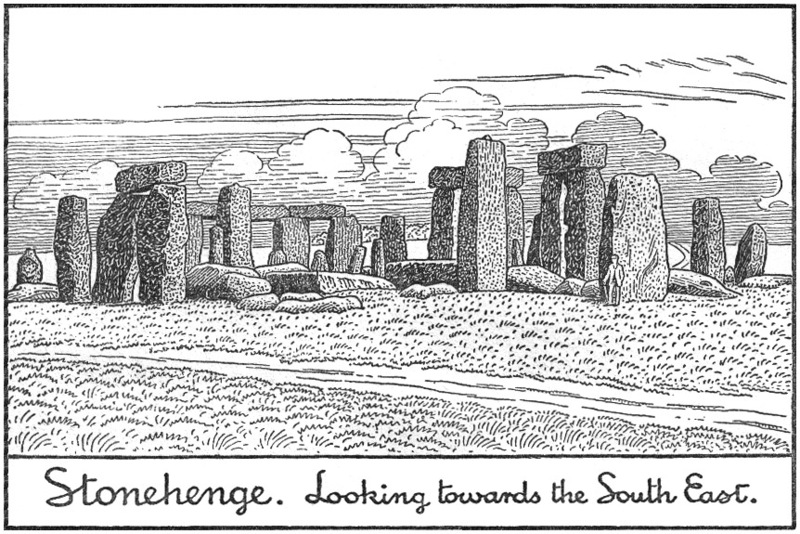 At the meeting of the British Archæological Association at Devizes in 1880, a visit was paid to Stonehenge, and there were, as usual at such gatherings, papers and discussions dealing with it. Mr. William Cunnington, F.S.A., specially put on record the fact that his grandfather, Mr. H. Cunnington, and Sir R.C. Hoare, remembered this stone as standing erect. Here at all events are three conflicting statements. Under these circumstances it is well to leave the Slaughtering Stone as a problem for posterity. Stonehenge. 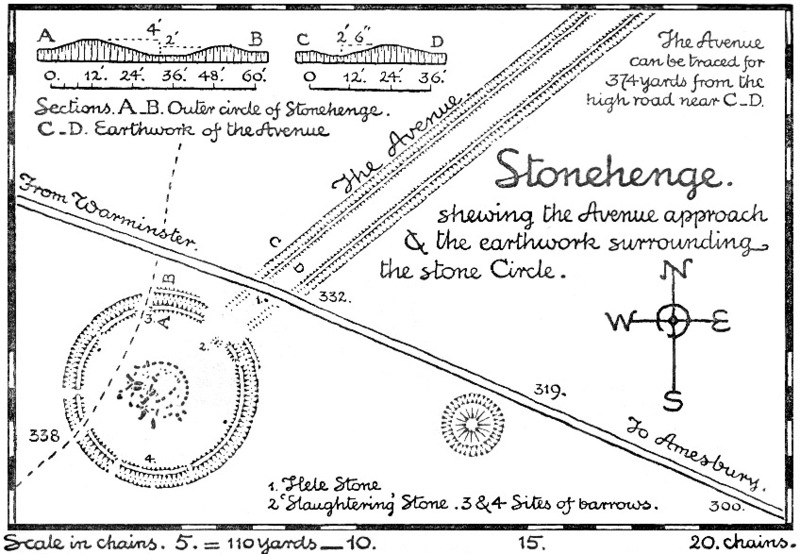 shewing the Avenue approach & the earthwork surrounding the stone Circle. Visitors entering Stonehenge are apt in their eagerness to reach the stones to overlook a definite banked Avenue leading from the north-east towards the Hele Stone, and entering the circular earthwork enclosure. This earthwork is not very considerable to-day, but in the Stonehenge of yesterday it was probably far more marked and imposing. This Avenue extends from Stonehenge in a straight line northwards for about five hundred yards, where it divides into two branches, one going eastward towards the Avon, where there is an ancient ford, the other continuing northward until it joins yet another earthwork, generally known as the Cursus, about half a mile distant. The whole Avenue has suffered greatly in recent years and is fast disappearing entirely. Both the circular form of the earthwork enclosing Stonehenge, as well as the straight and parallel banks of the Avenue, are specially worthy of notice. They belong to a class of earthwork quite unlike the usual planning of cattle enclosures, and defensive works, and exhibit a precision in setting out which is only associated with the sepulchral and religious earthworks of prehistoric times in this country. The question is often asked, "How did they build Stonehenge?" There is a refreshing simplicity about that indefinite word "they," but for the present, whoever "they" may be, it is possible to some extent, at all events, to furnish an answer to this ever recurring query. In the first place, however, it may be well to recapitulate very briefly the conclusions already arrived at, before entering into a more detailed description of the tools which were employed in the work of erection, and the methods by which the huge Sarsens were reared into position. Stonehenge is a circular monument, enclosed by a circular earthwork, and approached by an avenue lying north-east and south-west. Without the circle lie four Sarsen stones. The Hele Stone, and two smaller stones unworked, occupying definite sites with reference to the rising and setting of the sun at the Summer and Winter Solstices; and the so-called Slaughtering Stone, the use of which is at present a matter of speculation. 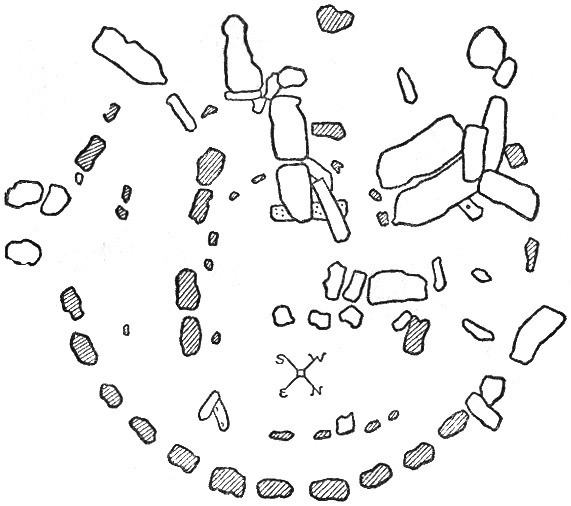 The monument proper, consisting of a circle of Sarsen Trilithons, enclosing a circle of upright foreign stones. Within these, five detached Sarsen Trilithons, of graduated height. These five Trilithons are set horseshoe wise. Before them a standing horseshoe of foreign stones, and in the front of the great Trilithon a flat slab or altar stone. From this stone it is possible to look outwards towards the Hele Stone, which lies in line with the axis of the monument drawn through the centre of the Altar Stone. The Sarsen stones were obtained from the immediate neighbourhood, the foreign stones must have been imported from a very considerable distance. All the stones, with the exception of the four specially indicated, have been worked. The question naturally arises how were they worked? The answer to this may be given without the least hesitation: with stone tools. For many years the method of working the stones was a matter of great debate, and the uncertainty then prevailing permitted many theorists to speculate on the "Roman" origin of the structure. Now, however, the entire absence of any metal which resulted from Mr. Gowland's excavations in 1901, at once precludes the possibility of the builders being anything but a primitive people, to whom the use of metal was unknown, or only partly known. The stone tools in use in the construction of Stonehenge were of four kinds. i. Axes of rude form roughly chipped, and with a cutting edge. ii. Hammer-axes, chipped to an edge on one side and flat on the other. iii. Rounded hammer-stones; many of which show signs of bruising and hard wear. The material used in these three classes was flint. All of these tools would have been used in the hand, and not set in a handle. iv. Rounded hammer-stones of Sarsen, varying from one pound to six and a half pounds in weight. They would have been used for the surface dressing of the stones, to which reference will be made later. v. Mauls of compact Sarsen weighing between thirty-six and sixty-four pounds. The broadest side of these was more or less flat, and when wielded by two or three men they were capable of giving a very effective blow. Their use would have been for breaking the rude blocks into more or less regular forms; and consolidating the rubble foundations. It is specially notable that no ground or polished stone implements were found among them. Stag's horn pick from Stonehenge. In addition to the stone tools, picks of deer horn were employed for quarrying the chalk when making the foundations of the uprights. Those who are familiar with the antlers of the deer, will recall the sharp pointed tine, known as the "brow tine," which projects forward from the horn above its core or socket. This was the tooth of the pick, all other tines being sawn off; thus transforming the antler into a very rough implement closely resembling a pick, with a single point. Many splinters from these picks were found actually embedded in the chalk of the foundations, and one entire discarded example was discovered showing great signs of use, the brow tine being worn away to a considerable extent. There can be little doubt that the Sarsens were first of all roughly hewn into shape, before they were conveyed to the site. It stands to reason that a primitive race, when faced with the problem of transporting a vast mass of stone, would first of all reduce its bulk to the approximate proportions which it would have when finished and erected. 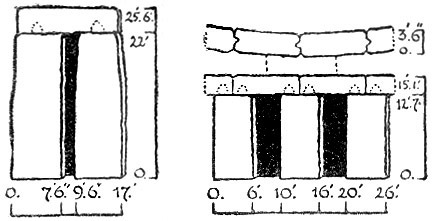 Moreover, the chippings and mason's waste discovered in the excavations of 1901 reveal comparatively little Sarsen stone, and only a few large fragments, such as must have been broken off in finally reducing the "Grey Wethers" to monolithic pillars and lintels. It must not be forgotten either, that the Sarsens occur naturally in tabular blocks, well adapted to the purpose of the builders. The surface of these blocks is often soft, and sugary, while the body of the stone is dense. The nature of their composition is such that no two stones are quite alike in hardness, some can be disintegrated easily, even with the fingers, while others are dense, and will resist blows with a hammer and chisel. But in any case the natural structure of the stone made it an ideal material for the Trilithons, or, it may be, that the Trilithons were the natural outcome of the physical peculiarities of the rock. 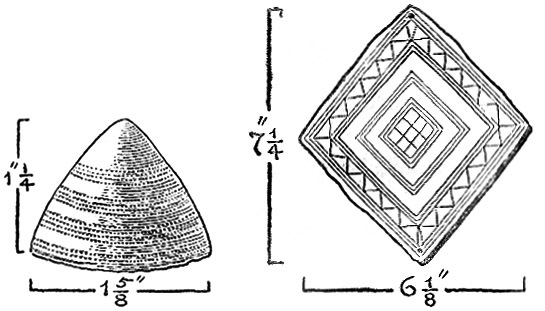 The preliminary dressing may very possibly have been effected by lighting small fires along the proposed line of fracture, and heating the stone, and then by pouring cold water upon it, which would originate a cleavage in the grain, which would readily break away under blows from the heavy mauls referred to in Class V. of the Implements. Sides and ends could thus be roughly squared. The next point was the transportation of the rough ashlar to the site. Here the problem is not so formidable as it appears, when it is remembered that time was no object to the builders, that labour was abundant, and that in all probability the work was undertaken under the stimulus of religion. Labour, tree trunks, and stout ropes of twisted hide would have proved sufficient. It is only necessary to consider very briefly the megalithic monuments in Egypt, Assyria, and elsewhere, to see that such tasks were well within the capacities of a race emerging from comparative savagery. There exists on the wall of a tomb at El Bersheh in Egypt a very characteristic illustration of the transport of a Colossus; such as are to be seen in situ in Egypt to-day. The approximate date of this is B.C. 2700-2500, and prior to Stonehenge by about 1000 years. Arrived at the site, the more skilled work of final dressing was completed. A close examination of the face of some of the fallen stones reveals several shallow grooves on the face with a rib or projection between them. It has been suggested that the rough stone was violently pounded with the heavy mauls until the surface was broken up and reduced to sand for a considerable depth, and the débris brushed away. The projecting ridge resulting from this could then be cut away by hammer and stone chisel, or even by the hammer alone. Hitherto no word has been said as to the arrangement of mortice and tenon, by which the Trilithons are keyed together. This has been done purposely, in order that the constructional questions relating to Stonehenge should, as far as possible, be dealt with together, and in due order. In the outer circle of Trilithons each upright had two tenons worked on its apex, to bear the two lintels or horizontal stones which rested upon it. Corresponding mortices were sunk in those stones to admit the tenons. In the case of the Trilithons of the Inner Horseshoe, only one tenon on each upright was necessary. Further, the ends of the lintels of the outer circle were shaped so as to dovetail into one another, and form what is known as a "toggle" joint. This can easily be seen to-day, in the group of three Trilithons which lie between the Altar Stone and the Hele Stone. 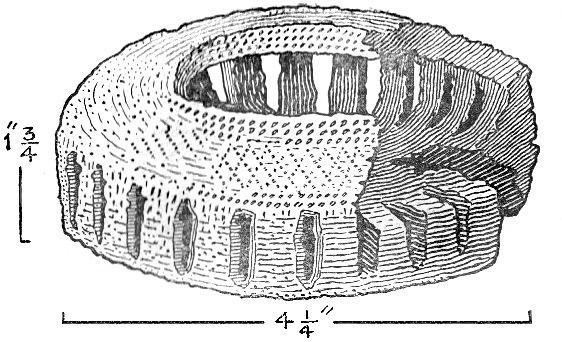 This careful arrangement, of mortice, tenon, and toggle, has doubtless very much to do with the comparative stability of Stonehenge at the present day. Had these simple but effective measures not been taken, it would not be exceeding the bounds of possibility to say that to-day the ruin would have presented a mass of fallen stones, and the task of their reconstruction would be well-nigh impossible. Evidently the early mason found the cutting of these tenons by no means an easy task, for, with two exceptions, the workmanship is not remarkable. Luckily for the observer to-day the tenon on the remaining upright of the Great Trilithon is very strongly marked, and stands out boldly on its apex, thus affording a clue to those existing on other stones. The mortice holes were easier to accomplish. A small depression may have been made first of all, and then a round stone inserted with sand and water. In this way a smooth hollow could soon be worn. This principle is and has been applied by stone-using peoples in all quarters of the globe. The rough dovetailing of the lintels of the outer circle would present no difficulty to users of the tools already mentioned. To-day the surfaces of the Sarsens bear undoubted signs of weather, but in the Stonehenge of yesterday the Sarsens were beautifully finished with rough tooling all over their surface. This final finish was achieved by the Quartzite Hammers (Class IV.). A very beautiful piece of this work was discovered by Mr. Gowland in 1901. In the process of raising the upright of the Great Trilithon, a thin slab of that part of the stone which had been buried in the foundation became detached. The tooling upon this fragment is absolutely perfect, and as clean and sharp as it was when it left the hand of the craftsman about four thousand years ago. So remarkable was the workmanship that experiments were made on pieces of Sarsen with various materials to endeavour to secure the same quality of surface, during which it was found that whereas the ordinary masons' chisels of to-day failed to produce the effect, a quartzite pebble used as a tool at once reproduced the character and surface of the original finish on the Trilithon. The foreign stones appear to have been treated in a very similar manner, but it is not possible to discuss this with the same detail as in the case of the Sarsens, for the body of the rock to be dealt with varied vastly in quality and fracture. The method of dressing by pounding was probably not adopted. Quantities of small chippings from the foreign stones were found in 1901, so many indeed as to justify the claim that these stones were actually dressed on the spot, and not partly shaped before being transported to the circle, as in the case of the Sarsens. This at once disposes of a popular and ingenious suggestion that the foreign stones were originally a temple elsewhere, and that in migrating to Salisbury Plain, the tribe had brought their temple with them. Contrary to another cherished belief, the Sarsen Trilithons were erected first, followed by the foreign stones. The building of the group was continuous and no gap separates the Trilithon from the foreign upright. Of this abundant ocular proof was forthcoming in 1901, when the foundations of the great Trilithon were laid bare, and the leaning upright restored to its original perpendicular position. When the ground was opened it was found that each upright had been differently bedded in the earth—and for a very good reason. The one was twenty-nine feet eight inches long, while the other was only twenty-five feet. Obviously they were the two finest "grey wethers" obtainable in the flock, and because of that, they were set aside for the most prominent place in the enclosure. The master builder decided that the height of this central Trilithon should be the equivalent of twenty-one feet at the present day. Therefore it was necessary to bed one stone deeper than the other, in order that their two summits should be level to receive the lintel, or impost. One stone, therefore, was sunk to a depth of four feet, while the other extended downwards eight feet three inches. To compensate for the lack of depth in the shorter stone, its base was shaped into an irregular projecting boss to give it a greater bearing area. It was decided to raise the larger stone first, and the foundation was dug as follows: A slanting trench was cut with the deer's horn picks through the earth and chalk, having at its deeper end a perpendicular chalk face against which the Sarsen could rest when upright. Rubble and chalk were cleared away, and the stone carefully slid down the plane to its foundation. To raise it, now that its base rested against a solid wall of chalk, was not a great matter. The same ropes of hide and tree trunks which had served for its transport would again have come into play. Slowly it would be levered up, and packings or wedges of wood or stone inserted. Thus inch by inch, probably, it rose higher and higher, strutted up, perhaps, by strong saplings as it reared its head above the busy crowd of builders. Blocks of Sarsens were packed beneath it to equalise the bearing, and then the excavation was filled in with chalk and rubble, which doubtless was well rammed down and consolidated with the big sixty-pound mauls. Among the packing of chalk and rubble were found a considerable number of the rough implements already referred to. The central Entrance of Stonehenge. Looking S.W. The shorter upright was next set on end. A shallower excavation had to suffice in this case, but the base of the stone, as has been already intimated, was wider, and to secure greater stability blocks of Sarsen were provided for the stone to rest on, other blocks being packed in carefully as it was raised, and curiously enough among the firm packing were several large stone mauls, fitted in to make the whole mass solid and compact. There is no direct evidence as to the actual method of placing the imposts upon the uprights. It has been suggested, and with every show of reason, that one extremity of the imposts would be raised and packed with timber. The opposite end would then be similarly treated. In this way, by alternately raising and wedging first one side and then the other, the impost could have been brought, in time, level with the summit of its upright, and levered over on to the tenons. Such a method is employed by primitive races to-day. The five Sarsen Trilithons already mentioned were raised into position from the inside of the circle. Investigation has shown this to be a fact. It therefore stands to reason that the Foreign Stones were erected last, and not first as has so often been supposed. This is a hard saying, for it at once negatives the picturesque legend that the Foreign Stones were a stone circle brought from Ireland, and erected by a colonial tribe, who afterwards gave dignity to their primitive temple by the erection of stately Trilithons. Furthermore, the débris of the ancient mason reveals chippings of Sarsen and Foreign Stone intermingled so thoroughly as to preclude any idea of two separate periods of building. Stonehenge, therefore, was erected at one date and continuously. It is a question, as yet, if the outer Sarsen Trilithons were erected from the outside or the inside of the circle. It has not been possible, in the foregoing brief description, to enter into minute detail, but it is hoped that sufficient has been said to show the stages by which the work of building was approached. First, the rough trimming of the Sarsen, as it lay upon the Down, then its transport to the spot, its final dressing, and the preparation of its foundation, followed by those anxious days during which the builders toiled as they raised it aloft; the feverish haste with which they rammed and packed the loose rubble about its foot, casting in their mauls and implements to wedge and fix it securely on its base: and last of all, the final effort of raising the impost on its wooden bed, rising now on this side, now on that, as the packings were inserted beneath the levered stone. What a contrast to the Stonehenge of to-day—abandoned and silent on the fast vanishing Plain of Salisbury. Yesterday, it was the workplace of a teeming hive of masons, the air filled with the tap of the smaller hammers dressing the stone faces, with the sullen thud of the big maul pounding the face of a newly arrived Sarsen, while the faint muffled "peck" of the deer's horn told of trench workers dressing down a chalk face to receive the thrust of the monolith, while high above the steady tap of the picks and hammers came the sounds of an unknown tongue raised now in command, now in argument, or encouragement as the work went on. Until comparatively recent years, the date of Stonehenge was a subject for speculation, and so fascinating did it prove that it attracted the attention of a vast number of minor authorities, who in the face of no definite data on which to base their theses, set the date of Stonehenge at almost any period except that to which it has been proved to belong. Many decided definitely that it was of Roman origin. For the most part, these speculations have not been based upon the tangible evidence of the Stones, the Tools, and the Barrows, but rather upon the records of early historians, whose evidence in those days was probably not a question of first-hand information. After all, the objects actually exhumed from the foundations of the Stones, must of necessity be the evidence of greatest importance. What are these objects? The following is a complete list taken from Mr. Gowland's report. Excavation I. (Seven feet deep. )—A Roman coin of Commodus and a penny of George III. at eight inches below the turf. 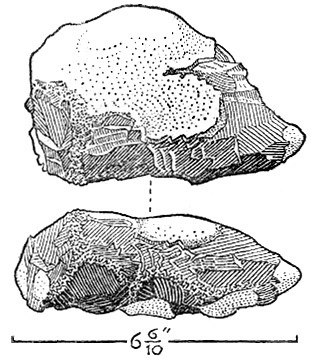 A flint hammer-stone, and a splinter of deer's horn embedded in the chalk, at a depth of two and a half feet (below datum line). Excavation II. (Eight feet deep. 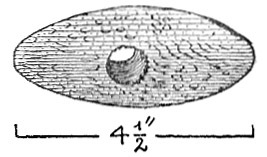 )—Two, edged hammer-stones of flint, and two rounded ones of the same material, at a depth of three feet (below datum). Excavation III. (Eight feet three inches. )—A halfpenny of George I., just below the turf. A Roman coin (sestertius of Antonia) ten inches below the turf, and a pewter farthing of James II. at the same depth. Below this, at a depth varying from two feet to four feet, were twenty-six axes and hammer-stones of flint, two hammer-stones of Sarsen, and a large maul of the same material weighing over sixty-four pounds. 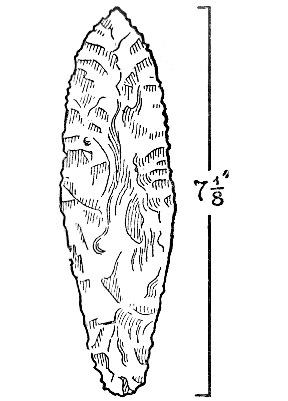 A fourth excavation, known as Excavation Q, yielded at a depth of three feet six inches to four feet six inches, ten flint axes, one sandstone axe, nine edged flint hammer-stones, four rounded flint hammer-stones, ten Sarsen hammers, and seven mauls, weighing from thirty-six to fifty-eight and a half pounds. Large numbers of deer's horn splinters were discovered in this excavation. Excavation V. (Eight feet deep. )—Four axes of flint, one of Sarsen, three edged hammer-stones of flint, one Sarsen and one Diabase hammer-stone, were found at depths varying between two feet and four feet. One Sarsen hammer-stone was found under the base of the foreign upright, which stands in front of the upright monolith of the Great Trilithon, at a depth of six feet below datum. In this last excavation, at a depth of about seven feet, the slab of tooled Sarsen already referred to was discovered, and on it a very small stain of copper carbonate. The depth at which this stone was discovered precludes the possibility of metal being thus sunk by moles or rabbits. This list, like the details of the foreign stones, may not be of general interest, but it affords a very powerful argument for the date of the structure. To summarise the "finds." The metal objects found consist of various coins ranging from Roman to recent times, about half a dozen in number, all coming from the surface, and none at a greater depth than ten inches. In other words, they may be classed as "superficial" finds, of very little value; the more so, as some of the more recent coins were found at a greater depth than those of earlier date. The only other trace of metal is the small green stain upon the slab of Sarsen already alluded to. This stain can only have been caused by the contact with the stone of a small fragment of copper, which appears to have been entirely decomposed, as no traces of it could be found. It must have been very minute, since had it exceeded one-eighth of an inch, it could not have escaped the mesh of the sieve employed in searching for it. Clearly, therefore, it could not have been an implement; perhaps it was an ornament. On the other hand, the Stone Implements discovered number one hundred and fifteen, and were found scattered through the excavations at all depths, and even under the foundations of one of the foreign stones. Probably the entire area of Stonehenge, if opened up, would yield over seven thousand examples. The evidence of the Stone Implements goes far to give the date of the building. Horn picks similar to those employed at Stonehenge have been found in considerable numbers at Grimes Graves, where they were used for excavating chalk in order to win flint for implement making. Other picks have been found at Cissbury, near Worthing, where similar chalk workings existed. This resemblance between the finds at Stonehenge, Cissbury, and Grimes Graves, does not, however, end with the picks; it is repeated in the similarity of the Implements of Stone, those at Stonehenge being in some cases the counterpart of those found in the other localities. The Cissbury Implements have been assigned "to the Stone Age, or at any rate to the Age of Flint manufacture" by General Pitt Rivers, who discovered and reported upon them. Canon Greenwell describes the Implements from Grimes Graves as belonging to "a period when both metal and stone were in use." 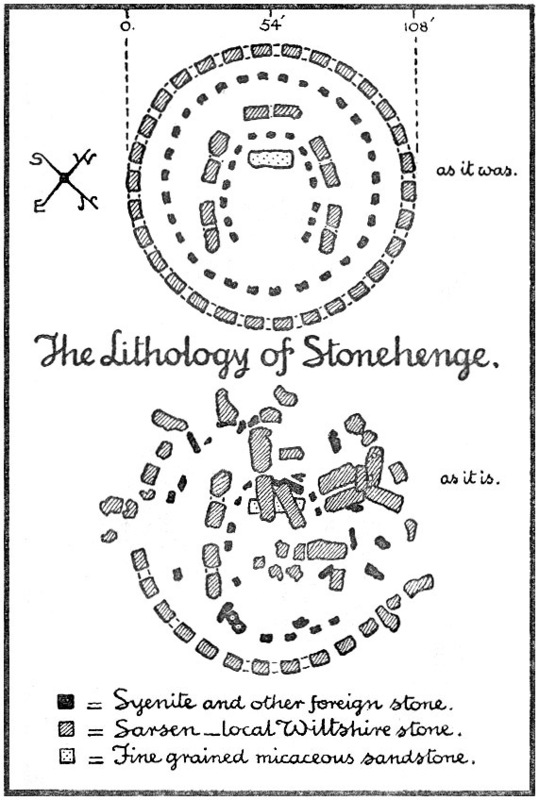 It is obvious, therefore, that the similarity between the tools used in the construction of Stonehenge, and those used in other parts of England for similar purposes, and definitely assigned to their period in the history of Man, demonstrates very clearly that the date of the building of Stonehenge may fairly be placed at a time when the use of stone was continuous with a partial use of bronze; and that if Stonehenge is not a Neolithic structure, it must certainly belong to the Early Bronze period. It might be urged that the roughness of the Tools, coupled with the marked absence of bronze, indicates an even earlier period than that already stated, but it must be remembered that the form of the implement is not always a criterion of its age. Moreover, bronze tools were not necessary for the dressing of the Stones, though had they been plentiful, it is more than probable that some might have been either lost or dropped during the work, and would have come to light during the excavations. Yet another sidelight upon the date of Stonehenge is to be found in the presence of chippings of foreign stone found inside some of the neighbouring Bronze Age barrows, which prove conclusively that the barrows must have been built at a date later than the erection of Stonehenge. To many people, the mention of a period of culture, such as the Early Bronze Age, may not convey very much. To give a date in years, on the other hand, is not always easy. The march of culture in those days was slow, and the gradation from the use of one material to another very prolonged, often reaching into centuries. Consequently any date must only be approximate and given under great reserve. The late Sir John Evans has suggested that the Bronze Age in this country might be set at 1400 B.C. Continental authorities set the age for countries in Europe somewhat earlier, at about 2000 B.C. This is a perfectly natural conclusion, for it is an ascertained fact that the flow of civilisation was from East to West, as has always been the case, and that, therefore, it is only to be expected that the Bronze Age of the Continent would ante-date that of England by some centuries. But, it is obvious from our present knowledge of Stonehenge that the Bronze Age was hardly established in the sense as used by Sir John Evans. Probably at the time of the building of Stonehenge bronze was only known as a rare substance, whose very scarcity would make it valuable as material for ornaments. It would not, therefore, be inconsistent with existing evidence to set the date of Stonehenge roughly at from 1700-1800 years B.C. The Megalithic Stone structures, which exist not only in this country but also throughout the Continent of Europe, are a special feature of that period known as the Neolithic Age. As has already been shown, Stonehenge represents a very late type, erected at a time when the bronze culture had begun to overlap that of polished stone (Neolithic). These stone structures can be roughly divided into three classes. 1. Single upright stones, or menhirs (Celtic = "high stone"), which may be commemorative of some great event or personage. 2. Dolmens (Celtic = "table stone"), in which a stone slab is set table-wise on three or four uprights. 3. Cromlechs (Celtic = "stone circle"). Circles enclosing barrows or dolmens. Stonehenge is a highly specialised example of this last class. Round these cromlechs popular myth and superstition have crystallised themselves into tales of the devil and his works (as in the case of Stonehenge), ogres, giants, dwarfs, Sabbath breakers, and infidels, turned to stone. In nearly every case there is some story of the supernatural, which cannot be accidental, but which must have its root in past religious observance. It is a recognised fact that the worship of stones is more widely distributed than any other primitive cult. Its almost universal distribution can be referred to the tendency of the half savage mind to confuse persons and things, and from seeming likeness of the inanimate to the animate, to endue the lifeless object with the virtue and power of the living object. This mental outlook is better understood in practice than in theory. A Melanesian native may come across a large stone, lying upon the top of a number of smaller stones. It suggests to him a sow with her litter of pigs, and he at once makes an offering to it, in the hope that he will secure pigs. In determining the function of Stonehenge, therefore, it will be useful to compare it with similar existing stone circles. The largest of these in this country is Avebury, not many miles distant from Stonehenge. Unluckily, to-day it is so ruined that its former greatness is hardly to be distinguished by the unskilled observer. Formerly comprising some hundreds of unhewn Sarsen stones, barely a score remain in position at the present day. In Avebury, as it was, can be found the early typic model of which Stonehenge is the final product. The use of the circle as a basic form is common to both. In Avebury the Sarsen is a rough unhewn monolith; in Stonehenge it is squared, dressed, and crowned with its lintel. All evidences of a slow evolution from Neolithic to Bronze culture. But whereas the circle alone is used at Avebury, Stonehenge has in addition the horseshoe series of Trilithons and foreign uprights, and in this particular differs from all other Cromlechs in this country. It is the climax of the Megalithic monument, and its use very certainly must have been connected with the religion of the race which set it up. It was, in short, a religious structure, probably used for the observation of the sun, and possibly connected with "nature worship." The fact that the sun rises over the Hele Stone on the Summer Solstice, and that it can be observed in direct alignment with the centre of the Great Trilithon, can hardly be due to accident. Chance might bring two stones into such a position on the Solstice, but, in this case, the entire monument is so arranged as to place the rising sun in a due line with its axis on this particular day. It will be well to consider the facts which must have been within the knowledge of the builders of Stonehenge, and to trace as far as may be their reasoning in the building of it. To begin with, it is almost certain that at the time of building, there existed some primitive form of priesthood, or body of "wise men." This is quite compatible with the culture of the period. The existence of the Neolithic Long Barrows is sufficient evidence that man had, by this time, arrived at that particular culture which grasps the existence of a "spirit." Death only terminated the existence of the body, and not that of the spirit. It was even able to return and enter another body, say that of a new-born infant, an animal, or tree. And being after the manner of human beings, spirits could understand human language and become accessible to human petitions. Thus a spirit might even prove a powerful friend or enemy. And the dwellings of these spirits would be those great powers which meant so much to a primitive people; the sun, moon, stars, rivers, forests, and clouds; from which arose the two great classes of spirit, the "ancestral" and the "spirit of nature." From this general body was developed a regular hierarchy of good and evil spirits, gradually ascending to the conception of one great creative spirit, or superior deity. Stonehenge. Looking N.E. from the altar stone towards the hele stone. To these early men, therefore, there was always the problem of maintaining diplomatic relations with the unseen forces about them, and for this purpose a primitive priesthood became necessary. The chieftain would manage the temporal affairs of the tribe, those spiritual would be relegated to a special body of wise men, or intermediaries. These men would certainly, from the nature of their calling, be not so much men of action as men of learning, the recorders of history and tradition, students of the natural phenomena, and of all those signs and portents which concerned the good of the community. One of the earliest facts which impressed itself upon them must have been the horizon. It was above that horizon that the sun rose in the morning, and below that horizon that it sank to rest at night; further, when the sun had set the moon and stars peeped up from that line, and sank below it, all in due course. These were facts easily apprehended. The common people even had grasped them, but the wise men learned more. As the link between man and the spirits of the stars, sun, and moon, they came to recognise that the sun did not rise over the same spot on the horizon every day. In the summer it rose roughly in the north-east and set in the north-west. In the winter, on the other hand, it rose in the south-east and set in the south-west. Moreover, these variations would be found to be regular and recurring. The sun would appear to move every day after the Solstice towards the east, and from the east towards the south, back again towards the east, and once more northwards. A staff set in the ground would determine the range of the sun's apparent journey and its extreme limits or turning points. This would fix the Summer Solstice in the north-east, and the winter Solstice in the south-east. Even such simple learning as this was probably beyond the capacity of the tribesman, whose daily duties took him afield early and late. But it was to his interest that all such observations should be entrusted to individuals who could keep definite count, and know exactly at what part of the horizon the sun might be expected to appear. In this way the solar year might be mapped out and divided into Solstices and Equinoxes. Nor was this a mere arbitrary arrangement. The good of the community depended upon it. The agriculturalist depended upon the sun for his crops. It was essential that he should know the correct time to plough, to sow, and to reap. Without the aid of the "wise men" he had no means of knowing what day it was, or how much longer he could count upon the sun for his primitive agriculture. The "wise man," on his side, realised the importance of his knowledge, and doubtless used it to his own advantage, thus winning support and respect from his simple followers. Temples, or stone circles corresponding to temples, might face either to the north-east or south-east, for the Summer or Winter Solstice, marking the end of the sun's journey, or they might be directed towards the east, when the sun would appear in the appointed spot twice in the year; once in his journey southward, and once on his return; in other words, at the two Equinoxes. Stonehenge is so arranged as to mark the sun at its Summer Solstice. But, interesting as these speculations of the Sun Temple theory may be, the facts recorded by Sir Norman Lockyer in 1901 are even more so, as by independent calculations he has arrived at the same date for Stonehenge as the archæologist. Briefly his task was to calculate the extent of the change in the obliquity of the ecliptic since the building of Stonehenge. The whole process involves a certain knowledge of astronomical operations and calculations, and the reader is referred to Sir Norman Lockyer's book for the actual steps taken to arrive at his conclusion. But on astronomical grounds pure and simple he was able to fix the date of Stonehenge as "lying between 1900-1500 B.C." It is at all events interesting that his results should tally with those of Mr. Gowland who, working on entirely different lines, came to practically the same conclusion. Having proceeded thus far it is well, however, not to insist too strongly on the "Sun Temple" theory, on the lines already sketched out. It should be always remembered that the "Hele Stone" is an unworked stone, which stands without the circle, and does not form a symmetrical integer in the structure. Being unwrought it may have been erected at an earlier date, and might belong to an earlier culture. 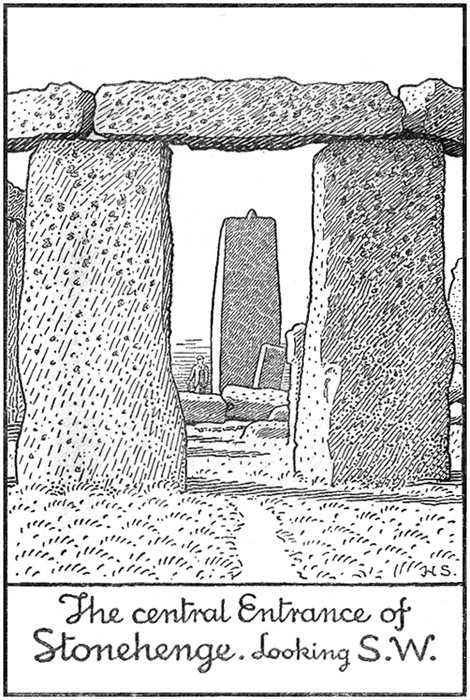 It is possible that Stonehenge may have been a later addition to the Hele Stone. Many of the arguments relating to the "wise men" and the observation of sunrise are matters of analogy rather than direct proof, and though coincidences are ever suggestive and fascinating, they cannot always be entirely accepted as proof. 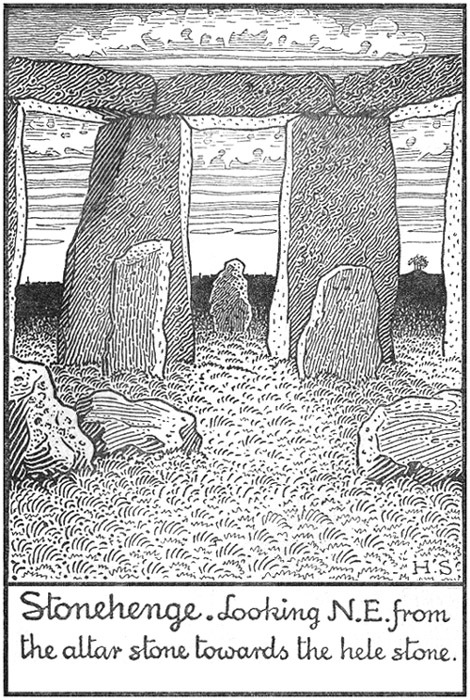 While it is quite possible that the Hele Stone was erected to mark the Solstice and to afford a definite means of determining the year, this may not justify the theory that the entire structure was an astronomical observatory and dedicated entirely to sun worship, with elaborate ramifications, and "observation" mounds for celestial phenomena. Weighing, therefore, the archæologist's and astronomer's evidence, it is fairly safe to conclude that Stonehenge can be dated at about B.C. 1700, and that its use was religious; probably a temple, in which the sun may have been adored in some way. As yet, however, the actual nature of that worship is a matter for speculation. It is of the utmost importance in dealing with a question like this, to observe the greatest caution and to maintain a strictly detached position. The astronomer, archæologist, geologist, and anthropologist have each their share in the solution of the problem, but each also has the bias due to his own special science. The mineralogist solves the problem of the Foreign Stones by suggesting a "glacial drift" without reference to the geologist, who will tell him that the local gravels contain no pebbles which belong to those classes of stones known as Foreign Stones. The astronomer, in his quest for alignments, will convert barrows into observation mounds, without reference to their uses and contents, and without allowing for the ignorance of the period, while the anthropologist often allows his imagination to carry him beyond the limits of actual fact. Time, and constant careful investigation, will pierce some of the mists which must always shroud the origin of Stonehenge, but the true solution will be for the field archæologist, rather than to the weaver of theories or the student in his library. The circular form, the horseshoe form, the unhewn Hele Stone, all bespeak religious origin. These are actual, visual facts, as is the sunrise on the Solstice. Around these arises a clamour of conflicting claims, each possibly containing much of real importance, each probably expressing some clue to guide the future worker on his way, but none containing that element of finality which is once and for all time to quell the storm of controversy which has ever raged about this ancient monument of the plain. Perhaps one of the most persistent traditions which has been passed on from generation to generation is that which connects Stonehenge with the Druids. There is, indeed, a vast literature on the subject of Druidism, but the actual knowledge of the subject is limited, and the entire question is very obscure. Much of the information existing is derived from a time when Christianity had long been established. The early Celtic religion has in fact been overlaid and embellished by so many later theories as to be particularly confusing to the modern student. Benedictine historians have discovered in Druidism traces of revealed religion by the simple process of confusing similarity with identity. The Gaul adored the oak tree, therefore this must have been a far-off remembrance of the plains of Mamre. Another class of writers have invented for the Druids the mission of preserving in the West the learning of Phœnicia and Egypt. The cults of Baal and Moloch have been grafted upon them, and so forth, until the very Druid himself is lost in a mass of crystallisations from without. The insular Druids, to which our national traditions refer, were far more likely to be mere "wise men," or "witch doctors," with perhaps a spice of the conjuror. This, at all events, seems to be the case at the time when we first acquire any positive information concerning them. Theirs it would be to summon the rain clouds and to terrify the people by their charms. The Chief Druid of Tara, decked out in golden ear-clasps and his torque of heavy gold, is shown us as a "leaping juggler" as he tosses swords and balls in the air, "and like the buzzing of bees on a beautiful day is the motion of each passing the other." Amazing as is the bulk which has been written about the Druids, their beliefs, knowledge, and ethics, it seems even more remarkable that so much should have been said to connect them with the building of the stone circles which they are credited with having constructed as astronomical observatories and temples. As has already been indicated, Stonehenge belongs to an epoch far earlier than any Druidism of which record remains. This fact rests upon the evidence of both the archæologist and the astronomer. It is, therefore, not a little puzzling that Sir Norman Lockyer, after fixing the date of Stonehenge at about 1700 B.C., should cite the Druids and their late Celtic cult in dealing with a monument which, on his own showing, was built in early Bronze times. There must exist a very wide gap of anything from seven hundred to a thousand years between the "May Year" Druids of whom he writes, and the builders of Stonehenge, and an interval possibly as great or even greater between Stonehenge and Avebury and those other north-east and south-east temples to which he attributes a Druidic form of worship. It is even a matter of grave question if the race who built the Stone Circles was not entirely different to the late Celtic inhabitants of the plain. Avebury has been classed as a Neolithic monument, built by the "long-headed" race whose remains are usually found in the Long Barrows; Stonehenge belongs to a bronze period, but at a very early date in that culture; its builders would probably belong to the round-headed type of man whose barrows are studded very closely round about it. It is impossible to approach Stonehenge without passing numbers of burial mounds or Barrows. North, south, east, or west they meet the eye, some singly, some in groups. In the immediate neighbourhood of Stonehenge there are two Long Barrows and three hundred Round ones, or, in other words, one-fourth of the Barrows in Wiltshire are to be found within a short distance of the Altar Stone of Stonehenge. This cannot altogether be accidental. The suggestion at once rises to the mind that these burial places clustering about the circle of Stonehenge are strongly reminiscent of the graveyard about the village church of to-day. The Rev. William Gilpin, writing in 1798, when as yet the Plain was unbroken by the plough and cultivation, recognised this fact at once. "All the Plain, at least that part of it near Stonehenge, is one vast cemetery.... From many places we counted above a hundred of them at once; sometimes as if huddled together, without any design, in other places rising in a kind of order. Most of them are placed on the more elevated parts of the Plain, and generally in sight of the great Temple." At one time it was considered that these Barrows were the monuments erected to the memory of warriors who had fallen in battle. Though this popular conception is still current, it seems hardly likely that a victorious army would tarry after the day was won to erect these laborious monuments, all of which are designed and laid out with no little skill. A far more reasonable hypothesis, and one more in accordance with fact, is that they represent the graves of exalted personages, and that their erection extended over a considerable period. The Barrows may be roughly divided into two classes: (i) the Long Barrow; (ii) the Round Barrow, with its three variants, the Bowl, the Bell, and Disc Barrow. The Long Barrow is the older form, and may usually be referred to the Neolithic Age. Wiltshire is specially rich in Long Barrows. There are no fewer than seventy-two within its limits, and fourteen others have been destroyed within the past century. They are usually found standing alone, and very seldom is it possible to find two of them within sight. They are also, as a rule, found upon rising ground. Their construction is somewhat curious. They vary from two to four hundred feet in length, thirty to fifty feet in breadth, and from three to twelve feet in height. The earth of which they are composed was dug out from a trench on either side of the mound. This trench did not, however, continue round the two ends of the barrow. They lie usually, but not always, east and west, and the eastern end is higher than that at the west. Within the higher end is the sepulchral deposit. Two such Long Barrows are within a short distance of Stonehenge. No metal objects have been found in these Long Barrows, though leaf-shaped flint arrow-heads, most delicately chipped, are almost invariably met with, and occasionally rough, hand-made, undecorated pottery. Most Long Barrows have been used for "secondary interments," i.e. other bodies at a later date have been buried in them. These secondary interments are sometimes associated with bronze or even iron. Interesting as the Long Barrows are, however, they are only mentioned as being, so far as present information goes, the earliest form of regular sepulture in this country. It is highly improbable that they have any connection with Stonehenge, which must have been erected at an age when the Long Barrow with its inhumed body was passing away, and the plain was being peopled with a new race, the "round-headed" people, whose method of burial was considerably different. The visitor to Stonehenge has only to turn his back to the "Friar's Heel," as he stands on the Altar Stone, and he will see a typical "group" of Round Barrows, seven in number. Let him remember, then, that Wiltshire boasts of two thousand similar sepulchral mounds; and that he can, within an easy distance of Stonehenge, find three hundred of them, while in the same radius he will only encounter two Long Barrows. The proportion, therefore, of round to long is considerable, viz. 1:150. The figures of round and long for the entire county are eighty-six Long to two thousand Round Barrows, or 1:24. In other words there are five times more Round Barrows in the Stonehenge District, than there are anywhere else in Wiltshire, taking Long and Round Barrows together. This disproportion in distribution cannot altogether be the result of accident; it must bespeak a special attraction for the spot by the builders of the Barrows, and from the very fact that Stonehenge was erected at a time when these people were first arriving on Salisbury Plain, it does not seem extravagant to claim that they had some reason for wishing their remains finally to rest within easy distance of what must have been to them a sacred spot. As already noted, these Round Barrows can be divided into three classes: 1. The simple Bowl-shaped Barrow, that most frequently encountered, having a diameter of from twenty to sixty feet, and a height of from three to five feet. 2. The Bell-shaped Barrow which reaches its highest development on the plain round Stonehenge, and is more common and more beautiful in Wiltshire than in any other part of England. 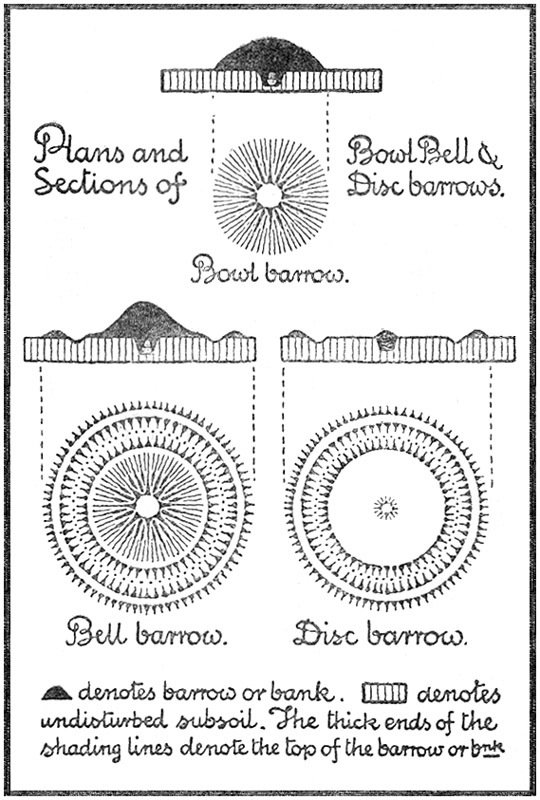 Plans and Sections of Bowl Bell & Disc barrows. Indeed, the Stonehenge Bell Barrows are the very crown of the Sepulchral Mound on Salisbury Plain. Unlike the Long Barrow, they are entirely surrounded by a circular ditch, from which material for the Mound has been excavated; within the ditch is a circular area level with the turf, from which the mound rises from five to fifteen feet in a graceful conical form. The diameter will be upwards of one hundred feet, so that the entire structure is considerably larger and more impressive than the Bowl Barrow. 3. "The Disc Barrow," so named by Dr. Thurnam, the great Barrow expert, from its resemblance to a flat dish surrounded by a deep rim. It consists of a circular area, level with surrounding turf, having a diameter of about one hundred feet. This circular area is enclosed by a ditch with a bank on the outside, both usually very regular and well constructed. Within, at the centre, is a mound not more than a foot high containing the sepulchral deposit. Occasionally there are more than one of these minute mounds, which often escape notice by reason of their insignificance. It is very significant that the Disc Barrow is more plentiful around Stonehenge than in any other part of Wiltshire. Elsewhere they are comparatively rare. In the "Round" Barrows it is not uncommon to find that the body has been cremated before interment. In the Bowl and Bell types, about three out of every four bodies have been so disposed of. In Dorset the relative interments, by cremation or otherwise, is four out of five, while in Cornwall cremation is almost universal. Almost without exception, however, the Disc Barrows contain only cremated remains. The existing impression is that these three forms of Round Barrow were in use at one and the same time, but that the Bowl Barrow was the earliest, followed by the Bell, and that the Disc is the latest form of all. From construction, if for no other reason, this hypothesis seems perfectly tenable. The Barrows on the Plain were built of the materials most easily accessible, mould, chalk, and flints, with occasional fragments of Sarsen. As has already been recorded, fragments of Foreign Stone from Stonehenge have been found in one of those forming the group which lay immediately south-west of the circle, but now destroyed by cultivation. The method of procedure was simple. A grave would in many cases be dug sufficiently long to contain the body if buried by inhumation in a crouching position. This grave would vary in depth from a few inches to six feet. Sometimes blocks of Sarsen would be built over the body to protect it. The crouching posture is specially noteworthy. The knees are drawn up to the trunk and the legs bent on the thighs, while the arms are closed towards the chest, and the hands over the face. There has been some speculation as to the significance of this particular attitude. Some have seen in it that of an unborn infant, others the natural position in death, others again have maintained it was the primæval posture of sleep. It seems quite possible, however, that the position may be due to mere utilitarian motives as being more compact for the purpose of burial. The lie of the inhumed skeleton is usually with the head to the north; exceptions show that the east, south-east, and south-west, have sometimes been selected, but never due south. Interments with the head to the west, as in Christian burial, are very rare. When burial by cremation took place, it is evident that the actual rite of burning took place elsewhere, and that the calcined remains were brought to the plain for burial. In some cases the ashes were conveyed to the spot wrapped in skins, or possibly in some rude form of cloth; more frequently in Wiltshire they were deposited in cinerary urns. The proportion of urn burial is as three to one. This method of conducting the cremation at one spot, and the subsequent removal of the ashes to another, generally considered sacred, is not uncommon, even at the present day. The urns were sometimes placed upright, at others they were inverted, the latter being the more common custom. The mouths of these urns were frequently stopped with clay, or closely packed flints. The urns vary in size considerably from nine inches to fifteen in height, and from about a pint to more than a bushel in capacity. A veritable giant rather over two feet high, the largest of its kind hitherto found in Wiltshire, is preserved in the Salisbury and South Wilts Museum. Another only two inches less in height was recovered from a Barrow within a third of a mile from Stonehenge. 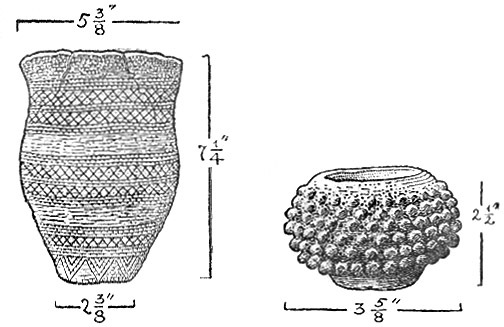 In most cases various objects were found associated with these interments, such as drinking-cups, food vessels, incense-cups, weapons and ornaments. The fictile vessels are all of a very primitive nature, being entirely moulded by hand, and showing no trace of the use of the potter's wheel. The body consists of a mixture of clay mixed with fine pebbles, or pounded flint, and sometimes ground chalk or shells. For finer work sharp sand has been employed. The firing is most primitive and imperfect. After drying in the sun the vessel was probably baked in the ashes of a fire of brushwood piled over and about it. The decoration, like the other processes, bespeaks a simple culture. It is usually in the nature of lines, or dots, varied now and then by thumb marks, many exhibit the impress of the thumbnail. A pointed stick would produce lines on the soft body of the vessel, so would a twisted cord, while a rude comb of points inserted in a stick, gave a fine dotted line. Circles, animal forms, or arabesques do not appear at all. Unique variety of 'Incense cup'. Normanton Down. The Cinerary Urns and Incense Cups were strictly sepulchral; the Food Vessels and Drinking Cups seem also to have been reserved for funeral rites, as they are not found apart from the Barrows, and placed beside the dead ceremonially, to contain provision for the Spirit in its voyage to the distant land to which it had departed. Both Food Vessels and Drinking Cups are rare in Wiltshire. Two were presented to the Salisbury Museum in 1915, both of which came from Hampshire. 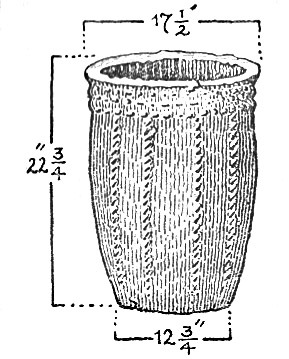 A similar vessel was found at Bulford in 1910, and is in the same collection. The "finds" in the Round Barrows are not, however, confined to pottery. 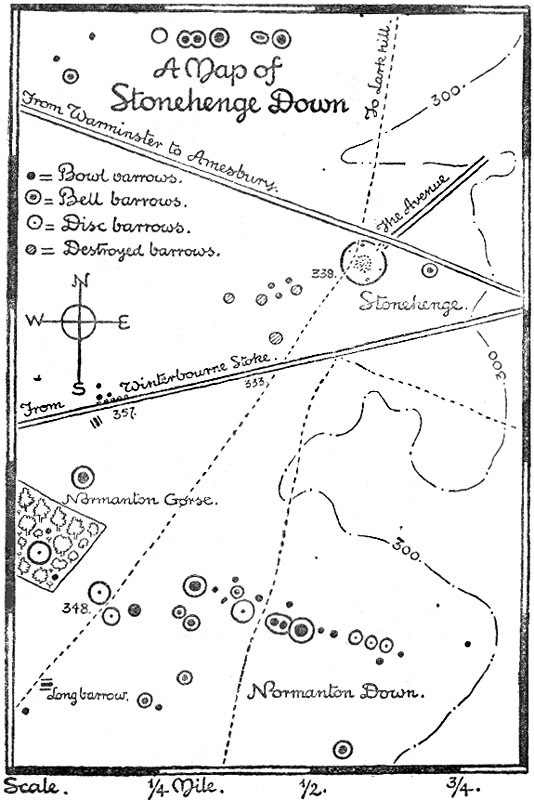 Weapons, some of stone, some of bronze, and occasional ornaments of gold and amber shed further light upon this departed race of Salisbury Plain. Although this people has been referred to as a "Bronze Age" people, it does not follow that their weapons were made exclusively of that material. In all ages there is a perceptible overlap from the former culture. In much later days the bow and arrow lingered on long after the introduction of fire-arms; so, too, in these early times, the stone implement was used side by side with the more recent metal one. Axes both perforated and unperforated have been found, but it is distinctly significant of an advancing culture, that the perforated axes outnumber the older form. Several of these stone hammer-axes have been found associated with bronze daggers and celts, showing that the use of stone and bronze was contemporaneous. Dagger blades of flint have also been found in barrows, though not commonly. Four such blades, which might perhaps have been javelin heads, were found in one barrow at Winterbourne Stoke. They represent a very high standard of workmanship, and elegance of form and finish. Three are of a delicate leaf-shape, while the fourth is lozenge-shaped. Flint arrow-heads when found are always finely barbed. The bronze objects, however, are in excess of those of stone, thus showing that the new bronze was displacing the older flint implement. Moreover, all the bronze weapons are of an early type. This is of some considerable importance, since it would seem to indicate that the Barrows were erected very shortly after Stonehenge, which it will be remembered has been referred to an early period of the Bronze Age. Certainly only a very short interval separates the completion of Stonehenge and the building of the Barrows; or to put it in other words, before Stonehenge was built there only existed two, or perhaps three, Long Barrows upon the Plain; but when it was finished, Barrows to the number of three hundred grew up around it, and all these Barrows, from their contents, belong to a period almost identical with that of the Stone Circle itself. Flat bronze celt. Normanton Down. No other Barrows in Wiltshire have been so productive of bronze daggers as those about Stonehenge. In some cases it has been possible to recover portions of the ornamental sheaths in which they lay. Their handles were of wood, strengthened occasionally with an oval pommel of bone. In some cases, gold pins have been hammered into the wood to form a zig-zag pattern. Personal ornaments also occur among the Barrow finds; more usually they are of amber, sometimes of gold, and occasionally of bronze. Ornaments of amber have been found in thirty-three barrows; the quality of the material is usually red and transparent, though sometimes a paler variety has been employed. These ornaments are mostly necklaces, either of beads, or of graduated plates perforated and strung together. One found at Lake consisted of nearly two hundred beads and plates, and when worn must have extended halfway down to the waist. Ornaments of gold were found in seven barrows. Many of these were built up upon a wooden mould, the gold being hammered on, and fastened by indentation. It is only natural that the appearance of the men who lived at this remote age should attract some attention. Were they tall or short, dark or fair? What manner of man was it who went armed with the bronze dagger and wore the ornaments above described? Of the cremated remains, of course, nothing can be said; but the burials by inhumation which took place concurrently with those of the Cinerary Urn, furnish certain data from which it is possible to gather some idea as to the physical stature of the man of that day. Taking fifty-two measurements of bodies as a basis, the man of the Long Barrow would stand five feet six inches, while the man of the Round Barrow would be three inches taller. But it is in the shape of the head, even more than in the height, that the people of the Long Barrow differ from those of the Round. The man of the Long Barrow was long-headed (dolicocephalic) while those of the Round Barrows were round-headed (brachycephalic). It must not, however, be imagined that there is any special connection between a long head and a long barrow, or a round head and a round barrow. The point of special importance is that the Long-Headed Race was the earlier, and that it was followed by a Round-Headed Race. Such a state of things is after all perfectly within the range of facts as known to-day. The early race, comparatively short, and armed only with stone weapons, must in the struggle for existence, have given place to a taller and more powerful people, provided with metal and possessed of a higher culture. There is no proof that the early race was exterminated by the bronze-using people. It is far more probable that a similar condition existed to that which obtains to-day in America, where the stone-using aborigines are slowly vanishing, and giving place to an Eastern invasion which has gradually displaced them. And whence came this powerful dominant race? It may safely be assumed that it came from the East. In this country the wave of Conquest has always flowed from east to westwards. Further, the man of the Long Barrow himself came from the East and displaced the earlier Palæolithic dweller about the close of the last Glacial Epoch, only in his turn to give place to the succeeding wave of taller and more alert settlers who followed him. These again melted away before the Roman, the Saxon, the Dane, and Norman, who in due course swept westward to these Isles, and similarly displaced one another. There is a recognised "Megalithic Route," as it is called, marked by huge stone monuments of the nature of Stonehenge, which, starting in India, can be traced to Persia, Palestine, Arabia, Morocco, Algeria, Tunis, Spain, Portugal, and Brittany, finally crossing the Channel to Devon and Cornwall. It must not be understood that these circles were all of them temples, or that they all belong to the Bronze Age. Many of them were merely stones set up round a Long Barrow. Aristotle states that the Iberians were in the habit of placing as many stones round the tomb of a dead warrior as he had slain enemies. A similar practice existed among the Australian aborigines. At all events the practice of erecting circular stone structures in all parts of the world seems to link together all primitive peoples of every age into one common chain of ideas, and of those customs which are the natural outcome of them. The chain itself lengthens till it touches the higher and more specialised builders, in whose highly-finished work the early ideal may yet be traced. The early race which built the vast circle or cromlech of Avebury finds a very fitting echo in the later race which set up Stonehenge; just as in Brittany the rude and unhewn menhir of yesterday, set up to commemorate a fallen chieftain, finds its elaborated and wrought counterpart in the Nelson column of to-day. Some light is cast upon the existence of these two peoples, the long-headed and the round-headed, by Cæsar, who refers to the former as an aboriginal pastoral people, while the latter are described as colonists from Belgic Gaul, and agriculturists. This distinction between the herdsman and the agriculturalist is quite in accordance with the stages of culture known and recognised by the archæologist. A pastoral race is ever more primitive and lower in the scale than one which has solved the problem of husbandry and acquired the very material advantages of a settled habitation, in contradistinction to the nomadic existence of the shepherd. Tacitus also describes these two races, and points out that while the herdsmen were fair, the tillers of the soil were dark and that their hair was curly. He was particularly struck, too, by the physical resemblance between the inhabitants of Iberia and the fair-haired race of the south and south-east of Britain, while he considered the dark-haired race was more akin to the people of the opposite coast of Gaul. Certainly the Iberian skull inclines to length, while that of Gaul is broad and short, and these physical peculiarities, much modified perhaps, prevail even to-day. It would seem, therefore, that the practice of building stone circles originated with the fair-haired pastoral race which had passed over from Europe to the West of England, but that Stonehenge is the work of a later dark-haired people who arrived from Gaul, with a higher and more organised civilisation, and that it is due to this that Stonehenge possesses those special features of wrought stone, and the horseshoe, which are not to be found in any of the earlier monuments of the shepherd race. Having erected Stonehenge, and possessed themselves of the land, the religious associations of the spot very probably impelled them to sleep their last sleep within easy distance of it. It must not be supposed that by so doing they regarded Stonehenge as a definite Sepulchral Monument: rather would it have been somewhat of the same spirit which even at the present day led to the burial of the heart of a well-known peer in the Garden of Gethsemane. Subsequently other forms of worship, such, for example, as Druidism, may have been practised at Stonehenge; but of these it is beyond the question to speak. These priests, whatever they may have been, were not the originators or builders of the circle, they merely used it for their own purposes; and their usages will in no way affect the central facts of the Stonehenge of Yesterday. There is a certain sense of relief, not untinged with reluctance, on laying down the pen after dealing seriously with so solemn a subject as Stonehenge. The feeling of relief is akin to that of the schoolboy whose task is done, and who is free to give vent to his animal spirits unchecked by the hand of his master. The feeling of reluctance is that which this same master must feel when he finally takes off his cap and gown and becomes as other men, his brief authority gone with them. Cap and gown are laid aside, and the present writer can now speak with his readers freely, and offer perhaps some few words of practical advice. The foremost question will surely be "How shall I get to Stonehenge?" The answer largely depends upon the constitution and habits of the querist. For the motorist, the way is clear: he will choose the best road, or his chauffeur will do it for him; but it is possible even with a motor to secure a little variety on the road. An excellent route is to follow the main road from Salisbury to Amesbury, passing Old Sarum, a very considerable earthwork of Roman if not earlier origin. This road will give the motorist a fine idea of what the Plain once was, with its wide expanses of undulating land. Military requirements have broken up what the farmer had spared, but even to-day the Plain has a character of its own, and forms a fitting prelude to a visit to the "Stones." Passing through Amesbury, the circle is soon within sight. Unluckily the Stones do not appear to advantage from this approach. The best view of them is from Lake Down, which may be obtained if the return journey is made along the Avon Valley by Normanton and Wilsford, Woodford, and Durnford. In any case barrows will be seen on every side, particularly in the neighbourhood of Normanton and Wilsford. Those who can walk, and who are able to be afoot for about ten miles, should follow the road up the valley from Stratford-sub-Castle, crossing the river either at Stratford or Upper Woodford, visiting Stonehenge and then Amesbury, thence by train to Salisbury. Allowance should be made for the fact that the railway station is some distance from the town. Is there anything else to see? Plenty. As already stated there is Old Sarum, which is perhaps rather too big an undertaking to be crowded into the same day as Stonehenge. All the churches along the valley are interesting. Stratford has its quaint hour-glass stand in the village pulpit. Heale House, where Charles II. lay in the "hiding-hole" some four or five days. Great Durnford Church, with its fine Norman doors. Amesbury, home of the adorable Kitty Bellairs, Duchess of Queensbury, and patron of Gay, who wrote the Beggar's Opera under her roof, and the church (early English) all make pleasant breaks in the journey. The bulk of the objects found at Stonehenge, and in the Barrows on the Plain, belong to the Wiltshire Archæological Society, and are preserved in their collection at Devizes. Visitors to Salisbury will find the journey by train somewhat lengthy, but it should not be neglected by the antiquary. Some very fine cinerary urns and Barrow pottery from the Plain, together with models, and a reconstruction of Stonehenge after Stukeley, are to be found in the Salisbury, South Wilts, and Blackmore Collections, at Salisbury. It is seldom that the eye of the artist, as well as that of the archæologist is to be found in one and the same individual. Mr. Heywood Sumner, F.S.A., to whom I am indebted for far more assistance in this volume than his beautiful and characteristic penwork, has seldom been so happy in his choice of illustration, for Stonehenge is one of those subjects which belongs to him of right, by virtue of that understanding draughtsmanship which he has applied with such valuable results to the "Earthworks of Cranbourne Chase" and elsewhere. Readers are specially asked to give his plans kindly attention. They are based upon the Ordnance Survey Maps, with the sanction of the Controller of H.M. Stationery Office. They are far more interesting, and less fatiguing, than the usual guide book production. The bibliography of Stonehenge is frankly too heavy a subject to attempt even briefly. A complete bibliography arranged under authors' names alphabetically by W. Jerome Harrison, F.G.S. (1901, Devizes), will be found quite solid reading in itself. Readers anxious to extend their information, would do well to study Mr. Gowland's Report in "Archæologia," 1902, side by side with Sir Norman Lockyer's Report to the Royal Society, of the same date. The two leading schools of thought can thus be contrasted at first hand. The Wilts Archæological Magazine passim, and particularly 1883 and 1876 should be consulted, the latter article by Mr. W. Long has stood the test of publicity for forty years, without appreciable damage. A curious writer to whom Mr. Sumner is specially indebted is Mr. H. Browne of Amesbury; whose conclusions must not be taken seriously, but who has lovingly illustrated his work with restorations and sketches: it is all the more pleasant therefore to render thanks to a painstaking but not always appreciated worker. Last of all—greatest of all—Sir Richard Colt Hoare, whose "Ancient History of South Wilts," 1812, remains to-day a classic. These grand volumes mark the dawn of the new era of the field archæologist. The foregoing names are few, but they are as old and tried friends, to whom reference can be safely made, and seldom in vain. When Hoare and Long have been digested, few authors have much else to offer, including the writer of the present lines. A most pleasant debt of obligation is to the new owner of Stonehenge, Mr. C.H.E. Chubb, who has rendered great assistance in the compilation of this little handbook. Himself a citizen of New Sarum, and a Wiltshireman by birthright, he can well be trusted faithfully to discharge his duty to the grand old Cromlech. A constant visitor to Stonehenge, he has already given a foretaste of his policy in revising the rates of admission to the military; a very gracious act, based on a common-sense appreciation of the usual condition of the pockets of H.M. forces. Landlords are not always as liberal. Last of all, my sincere thanks to Dr. H.P. Blackmore, Honorary Director of the Salisbury and Blackmore Museums, for reading and revising my manuscript.